The Association have made a quick decision in the wake of Martin O’Neill’s departure. 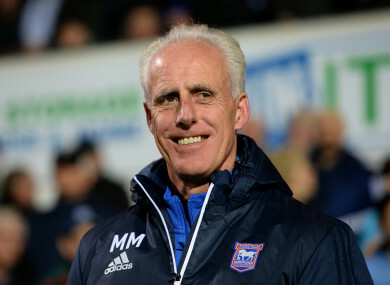 Mick McCarthy: will sign a multi-year deal. MICK MCCARTHY IS expected to be unveiled as Ireland manager tomorrow afternoon. The FAI have invited the media to attend a press conference with Martin O’Neill’s replacement at the Aviva Stadium. The 59-year-old, who led Ireland to the 2002 World Cup, lands the job ahead of Dundalk’s Stephen Kenny. Long-time assistant Terry Connor is expected to be appointed Ireland No 2 with record scorer Robbie Keane part of the backroom team. The FAI will also be using the opportunity to announce the appointment of the new Ireland U21 manager. Noel King left the post this year after eight years at the helm to take up a position as player identification manager within the association. Lee Carsley has been tipped to take the role, with Keane having also been linked to the vacant position. Dublin’s Convention Centre will host the draw for Euro 2020 qualification tomorrow week. Email “Mick McCarthy to be unveiled as Ireland manager tomorrow ”. Feedback on “Mick McCarthy to be unveiled as Ireland manager tomorrow ”.